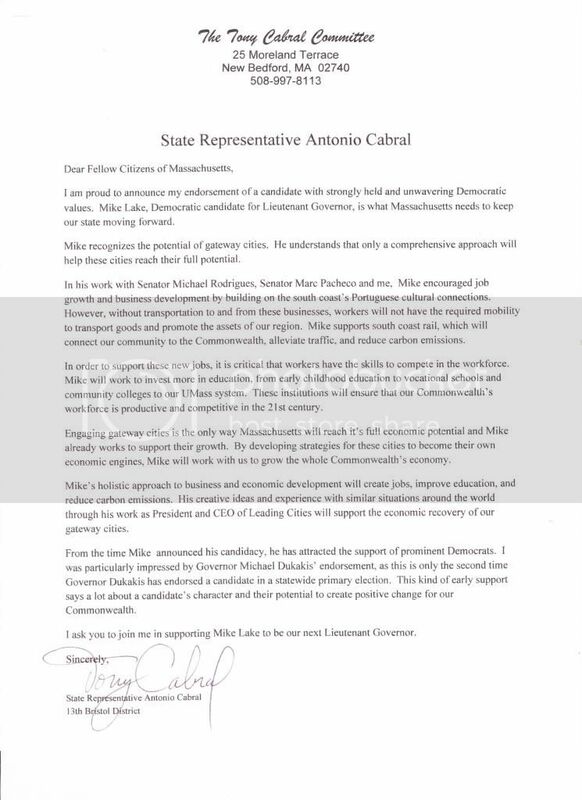 (April 16, 2014- Boston, MA): State Representative Antonio Cabral of the 13th Bristol District officially endorsed Mike Lake, Democratic Candidate for Lt. Governor. Rep. Cabral emphasized his experience working with Lake, along with Senators Michael Rodrigues and Marc Pacheo, to attract Portuguese business to the south coast. Rep. Cabral further commended Lake’s approach to strengthening Massachusetts’ economy by supporting local businesses and investing infrastructure and education. Cabral--the State Representative for New Bedford--cited Lake’s creativity and experiences as indicators of his ability to promote the economic recovery of gateway cities. He also expressed his admiration for the support Lake has already attracted. He specified Lake’s first endorsement as being especially noteworthy. Democratic Candidate for Lt. Governor Mike Lake was officially endorsed by State Senator Michael Rodrigues of the First Bristol and Plymouth District. Rodrigues emphasized Lake’s work to bring Portuguese ambassadors to the South Coast business community.